Won the ICTACT OUTSTANDING ACADEMIC PARTNER AWARD 2012 from ICTACT ACADEMY. Our textile HOD Ms.Devatha won the outstanding Academic coordinator award 2012 from ICTACT ACADEMY. LIVE WEBINARS are used to be arranged for students in our campus whenever the bridge conferences are being organized by ICTACT in Chennai, Coimbatore and in various places in and around Tamil Nadu. SKILLEDGE training is being given to our students through ICTACT from second year onwards. FSIT (Foundation Skills in Information Technology) training is being given to the students to prepare for NACH-Tech Test through ICTACT ACADEMY. We have launched - Oracle I-Mentor program - for school students through ICTACT ACADEMY. Our students had secured Twenty Six UNIVERSITY RANKS in 2011 and Six in 2010 Anna University Results published. N.Senthil Kumar, B.Tech(Textile Technology) got the University First Rank and won the Gold medal from ANNA UNIVERSITY OF TECHNOLOGY, TRICHY, (AUT-T). FLY HIGH - An International Educational trip for final year toppers of the institution had been launched in the year 2011. FLY HIGH-2011, the students were taken to MALAYSIA and visited UCSI UNIVERSITY. In the academic year 2011-2012, our students were placed in many companies such as IBM, Aircel, Cybernet,Slash Support, Cross field water Purifiers, Sutherland Global Services, Venture Electricals, Tech Mahindra, IDB Federal Insurance and many more. Various training programmes, guest lectures and industrial visits are being arranged for the students to make them industry ready. 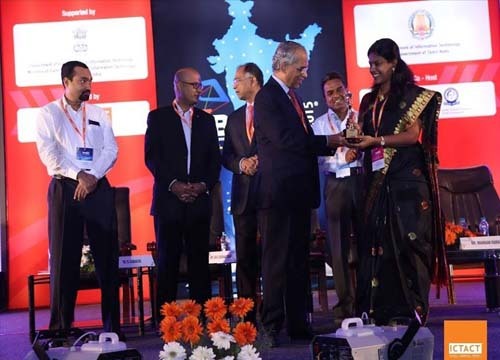 Students are encouraged and awarded for their final year projects and some projects are implemented in the college campus itself. Our MBA students were taken to INFOSYS, Mysore for a week training. NATRAJ MEMORIAL SCHOLARSHIP is being given to two of our students in every year. We have an active ALUMNI cell for helping and guiding our present students. Our biotech staff member Mr.Sudakar was selected as best NSS coordinator for Trichy Zone by AUT-T during the year 2010-2011. Our students were the Kabaddi winners in the Tamil Nadu Inter Engineering Sports (TIES) – 2009. Our students were the winners in the Basketball tournament for three times consecutively in the Anna University Chennai Zone (Zone 8). Science Exhibition named - EUREKHA - and - EdEx spell - bee competitions were conducted for the students of various zones at the school level. Won the ICTACT OUTSTANDING ACADEMIC PARTNER AWARD 2013 from ICTACT ACADEMY. Our textile HOD Ms.Devatha won the outstanding Academic coordinator award 2013, Consecutively for the second Year! All India Fide Rated Chess Tournament conducted by Pabcet in Puthiya Thalaimurai channel. Pavendar Bharathidasan Group of institution formed a HUMAN TREE (4450 members) on 05.10.13,chief guest of this programme Dr.V.PONRAJ/SCIENTIFIC ADVISOR TO Dr.A.P.J.ABDUL KALAM. Mr.V.Ponraj sir,Scientific Advisor to His Excellency Dr.A.P.J Abdul Kalam sir.Adressing -Pavendar Bharathidasan Institutions students. 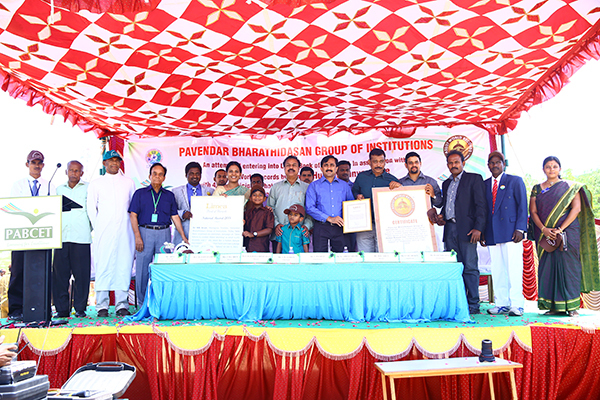 Pavendar Bharathidasan Institutions created a world record -entered Limca Book of Records and Assist world records -around 4300 students and faculty stood together like a Human Banyan Tree,holding saplings in their hand and took an oath to "Save Trees to combat Global Warming". Photos of the world record. Our Academic Director receiving the award on behalf of our Managing trustee Dr.M.R.Arun,M.B.B.S from His Excellency Dr.Rosaiah,Governor of Tamilnadu. Receiving from Mr.Kiran Karnick,Former President NASSCOM. Receiving from Mr.V.Ponraj,Scientific Advisor to Dr.A.P.J.Abdul Kalam. Receiving from Dr.Rosaiah, the Governor of Tamilnadu. Received from Honorable Dr.E.M.Sudarsana Natchiappan, Minister of state for Commerce and Industry. Awarded to individuals,Corporates and Colleges for contribution for social cause.The Awardees included Pavendar Bharathidasan Institutions,Sathyabama University.GM of Leela Palace,Mr.Tareen,Chairman of AKT Stategic Consulting,HCL and many more. Producing Toppers Year after Year. View our extensive photo gallery.